First off - thank you to everyone who participated in the version control survey! We've had a fun few weeks - Somehow the PowerShell Summit, Build, and Ignite were scheduled back-to-back-to-back. Among a host of other announcements and tidbits, we found that Microsoft has open sourced the DSC resources on GitHub, that Pester will be included in Windows, and saw a cool demonstration from Steven Murawski on using Test Kitchen to test DSC resources. These and other solutions and technologies are starting to assume you know how to use source control, and many require having a source control solution in place - how do you automate testing and deployment on a commit, if you have nothing to commit to? Source control has long been an important component of IT, but it seems IT professionals, particularly those in Microsoft environments, aren't consistently using it. 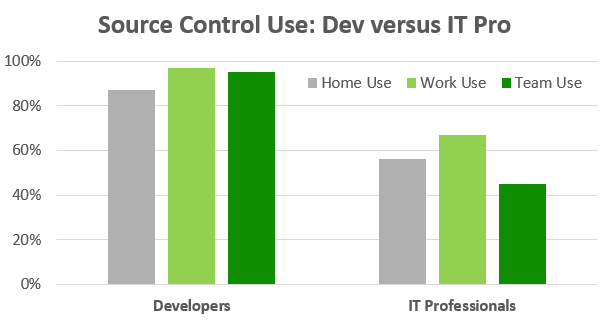 You might expect a gap between IT professionals and developers, but less than 50% of IT pro respondents used source control as a team. 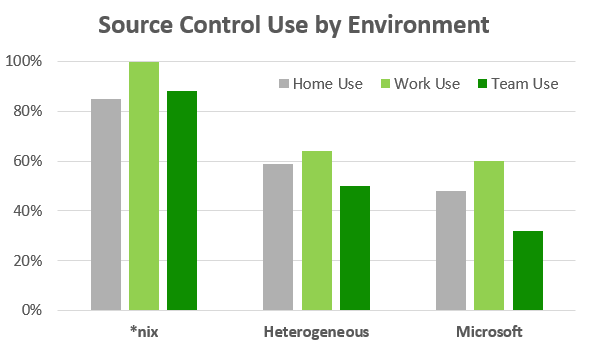 Breaking down the IT professional population by environment, we see that Microsoft environments are even further behind. Many PowerShell aficionados work on teams that aren't using version control. Long story short? IT professionals, management, and vendors have work to do; these new tools and ideas that rely on source control are great, but we need to work on finding a horse for the cart. The rest of my rambling analysis can be found here. If you want to get up and running quickly, consider using GitHub for your PowerShell projects. You can start with the easy-to-use GUI client, and drop into the command line when you want to get your hands dirty. It's a great way to start learning about source control, and to get involved in the community. Do you have any suggestions on how we can get to a place where using source control is common place for IT professionals? Is this a worthwhile goal? Sound off in the comments!